At Premiere Foot and Ankle, we follow the philosophy that for optimal patient care, education and a team approach are key. Dr. Rincker will take the time to listen to your concerns and with advanced technology and clinical skills, diagnose and help treat and relieve your pain in a cooperative approach. Pain and discomfort are not normal. This can be a sign of an underlying issue that needs to be evaluated and treated by a Foot and Ankle Specialist. Absolutely not. Conservative therapy in a stepwise approach is utilized if at all possible. Surgery is only recommended if other options are not feasible or have failed. Why See a Foot and Ankle Surgeon? There are 26 bones, 33 joints, 107 ligaments, and 19 muscles and tendons in the foot. We are consistently on our feet, and as the foundation of your body, painful feet and ankles can affect your entire body. Seeing an appropriate specialist, like a podiatrist, ensures you are receiving the best care possible for your foot and ankle conditions. Dr. Sarah Rincker is a Fellow of the American College of Foot and Ankle Surgeons. Founded in 1942, the American College of Foot and Ankle Surgeons is a specialty medical society of more than 7,400 foot and ankle surgeons. 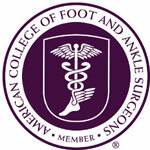 All Fellows of the College are board certified by the American Board of Foot and Ankle Surgery. Information about foot health is available at the ACFAS patient education website, Foot Health Facts, at www.foothealthfacts.org.